Donna Strickland is dedicated to improving the performance and health of leaders, teams and organizations. Drawing from her expertise as a board certified psychiatric clinical nurse specialist and a certified speaking professional with a master of science degree, Donna specializes in team, leadership and organizational development, health care reform and behavioral health transformations. 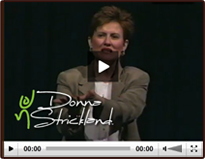 Donna is a highly acclaimed professional speaker dedicated to improving the performance and health of individuals, teams and organizations. Drawing from her expertise as a registered nurse, clinical specialist and certified speaking professional, Donna speaks on leadership, change, teaming and lightening up to save your life.